When power fails, whether it be scheduled or not, the transfer switch is the key to transferring to stand-by power and keeping you functioning as normal. Kohler® is a proven name in the generator and automatic transfer switch products and Illini Power Products can help you fit the right product for the right application. 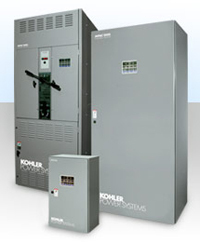 We provide an extensive product line of Kohler® transfer switch products and incorporate a solutions-based approach to fit your application.